Era is defined as long and distinct period of history with a particular feature or characteristic. For the Quinnipiac women’s basketball team, that feature has been the senior class, consisting of guards Edel Thornton and Brittany Martin, redshirt forward Jen Fay and forwards Aryn McClure and Paula Strautmane. The senior class is responsible for a 108-29 career record, including a 70-6 Metro Atlantic Athletic Conference (MAAC) record which includes back-to-back undefeated seasons from the 2017-18 season to the 2018-19 season. They’ve also been successful at defending their home court, going 37-6 at home, good for a .860 win percentage. 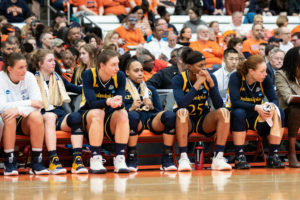 Quinnipiac lost to South Dakota State University at the Carrier Dome in Syracuse 76-65 on Saturday, March 23. Who led the way for the Bobcats? Their seniors. Fay, Strautmane and McClure all scored double-digits for the team, fitting the overall shape of their senior season as they were the top scorers and rebounders for the Bobcats all year long. Adding in Thornton and Martin, the class accounted for five out of the top six scorers while its forwards were three of the top five rebounders on the team. They recorded 71 percent (268-of-375) of the team’s steals on the year and the senior class owns the top five in terms of assists on the year. While the class’ forwards have consistently brought it, Martin had to silently work off the bench until given the opportunity to step up to the plate, and she ran with it. Thornton, an Ireland native, has been a thorn in the side of offenses everywhere, consistently bringing staunch defensive play. Her steals total reached a career-high 61 this past season. This all en route to a third straight MAAC championship, including a 52-game MAAC win streak, and third straight NCAA Tournament appearance. The senior class has knocked off the University of Miami twice in the “Big Dance” as well as Marquette, and now has a 3-3 NCAA Tournament record. This gave Quinnipiac its first three wins in the tournament and improved upon its 0-2 record prior. This season not only helped highlight the impact that this team has had on not only the program, but the university. That notoriety includes most of the major media outlets having to learn how to properly pronounce “Quinnipiac” on air and even spelling out the phonetic sounding of the name when it made its Cinderella run to the Sweet 16 the seniors’ sophomore season. This points to a common theme the sports world has shown to the Bobcats’ seniors – one that lacks recognition for their individual accomplishments. There is a common saying in sports: There is no “I” in “team.” Yet, when a team displays such consistent and dominant success, it should be impossible not to recognize the individual players for their personal accomplishment and contributions to the team’s success. Right? Here’s another question: how can three 1,000-point scorers not be recognized by the league? They reached this while having other prime scoring options on their teams over the years both inside the paint and beyond the arc. This came in the form of former Bobcat guards Adily Martucci (’17) and Carly Fabbri (’18), and forwards Sarah Shewan (’18) and Morgan Manz (’17). Despite all of this, it doesn’t look like they’ve received respect for their accomplishments from the outside world, but that never really mattered to them, according to Fabbri. As of now, it’s certain that one Bobcat senior will be heading back to the floor post-grad. The Trinity University Meteors announced on Monday, March 18 via Twitter that Thornton would be joining the team while pursuing a Masters in Psychology. While Thornton’s basketball career isn’t over, her and her class have pulled off the blue and gold for the final time. They are leaving behind a legacy that will inspire future student athletes to take the court for the Bobcats trying to emulate their success, and to add to the history that will forever hang from the rafters of the People’s United Center.